I’ve said it before and I’ll say it again, if you are doing a Whole30, get that guidebook haha! This is one of the recipes out of it and we really enjoyed it! It was easy, could be for breakfast, lunch or dinner and decent leftover too. Y’all know that is always an important point to make! 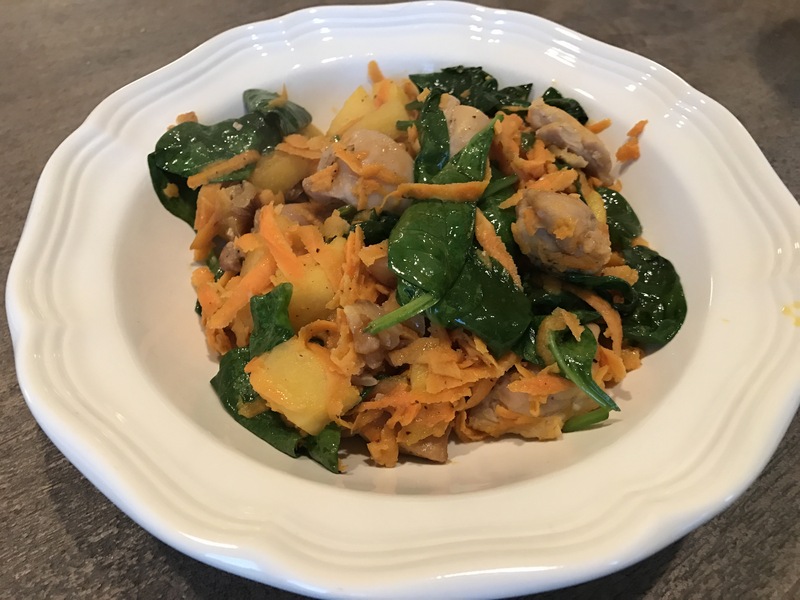 I haven’t made a ton of the recipes out of their guidebook, but it has a lot of good information regarding Whole30, a number of basic foods and just a wide variety of foods, so I would think everyone would probably be able to find something that interested them from it. 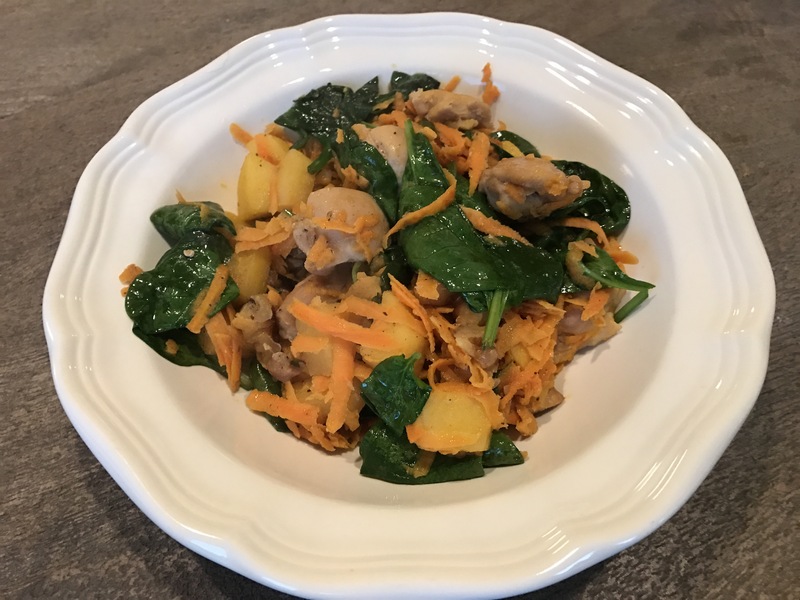 I snatched up this recipe when we were nearing the end of our third round of Whole30 because hello food boredom and I wanted something with a different taste to it than what we had been enjoying. I would say that if you want a lot of leftover to double this recipe. We really didn’t have much left after the two of us ate dinner. So here it is, I hope you like it too! Heat cooking oil in a large skillet. Once oil is melted, add the chicken and salt and pepper. Cook until brown, a few minutes and then add the chopped walnuts, stir chicken and cook a few more minutes. Keep moving the walnuts around the pan to make sure they don’t burn. 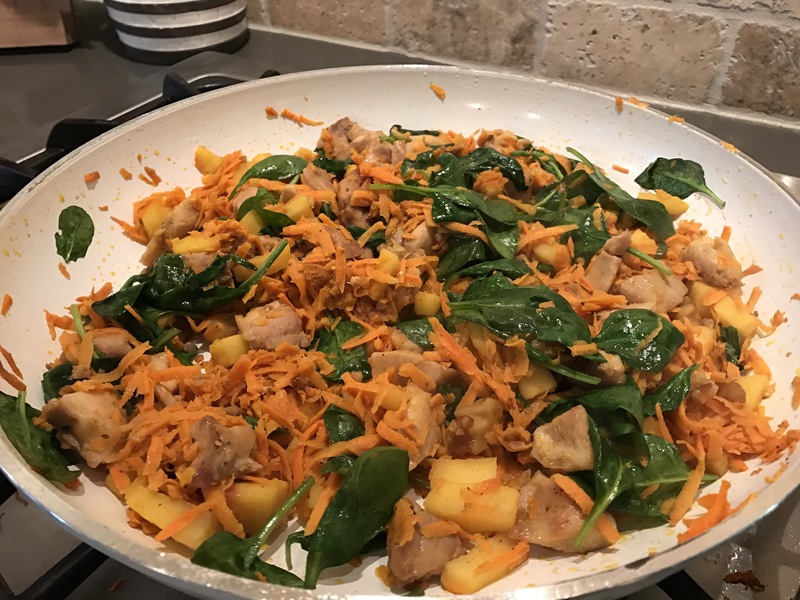 Add the sweet potato, apple and red pepper flakes and continue cooking another few minutes until chicken is completely cooked through. Add the apple cider/juice and mix all the ingredients together, scraping the bottom of the pan. Add the spinach and cook another minutes until the leaves are steamed and wilted. Add the splash of apple cider vinegar, stir and serve. Me and my littlest man 🙂 He’s almost always around me in the kitchen while I’m cooking.